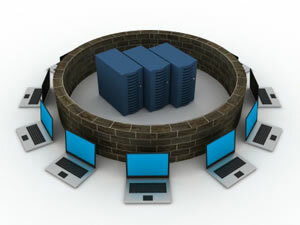 Network security is a broad topic and can often mean something different to different people. A good network security plan covers all aspects of network security: perimeter defense (firewall), anti-spam, port-blocking, complex passwords, auditing, data backup and a disaster recovery plan. Although there is a lot here to worry about, the good news is that many of these points can be addressed relatively quickly, giving you the peace of mind you need. SonicWall provides internet router/firewall devices that can do everything from basic routing, client-side VPN's, site-to-site VPN (WAN connections), email filtering, content filtering, etc. WatchGuard and SonicWall make very similar devices and just as good. Some people like SonicWall better, some like WatchGuard better, but overall the differences are very minor. Barracuda Networks provides hardware security devices that are focused on the specific function you need (web/spam filtering, load balancing, etc.). This is the next step up from SonicWall and WatchGuard and geared towards larger businesses.